The EPF engineering curriculum had no helicopter content, but Blanche Demaret found aerospace studies interesting and challenging. “These were just aeronautical courses, all disciplines, but in general more fixed-wing. In fact, rotary-wing first came into my life when I joined the DGA [Direction Générale pour l'Armement] in 1977 because this was the task I was assigned.” The French armaments procurement agency then managed mid- and long-term aeronautical research. “DGA is part of the French Ministry of Defense, and I was very interested in working for my country. The first job I got was in the research department for the Directorate for Research and Techniques (DRET) in the field of helicopter applications. The group I was working with specialized in aerodynamics and flight mechanics. Blanche Demaret left the DGA for research in 2004. “When Jean-Jacques Philippe, the director for rotorcraft research at ONERA, retired, he asked me in 2004 to be his successor. I was pleased to work again with the research teams I had known for a long time, like going back to the family circle. AHS International has also given ONERA’s rotorcraft director global contacts. “As an AHS member, I’ve had the opportunity to join a large and international network where all members are involved or interested in rotorcraft. 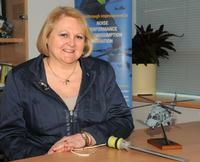 This is a unique community for rotorcraft people.” Blanche Demaret is deputy technical chair for the 70th Annual AHS International Forum this May, and will serve as the technical chair for Forum 71 in May 2015 in Virginia Beach VA. She is also a member of the International Committee for the European Rotorcraft Forum, and is now beginning to prepare for the 2016 ERF in France.